In a time of drought, several herds of dinosaurs seek an oasis known as the Great Valley. Among these, a mother in a diminished "Longneck" herd gives birth to a single baby, named Littlefoot. 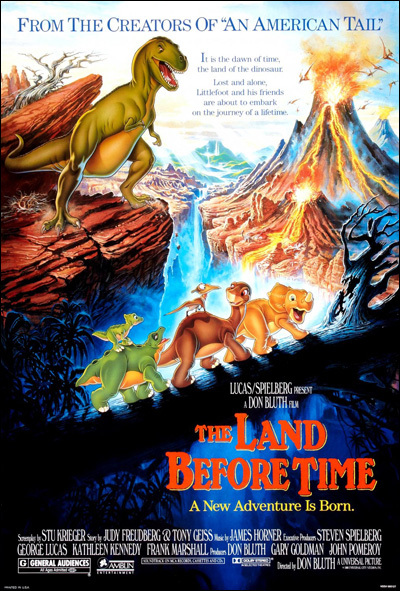 Years later, Littlefoot plays with Cera, a "Three-horn", until her father intervenes; whereupon Littlefoot's mother describes the different kinds of dinosaurs: "Three-horns", "Spiketails", "Swimmers", and "Flyers". That night, as Littlefoot follows a "Hopper", he encounters Cera again, and they play together briefly until a large "Sharptooth" attacks them. Littlefoot's mother comes to their rescue, receiving fatal injuries in the process. An earthquake swallows up the Sharptooth and divides Littlefoot and Cera from their herds. Littlefoot receives advice from his dying mother. Depressed and confused, Littlefoot meets an old "Clubtail" named Rooter, who consoles him. He is then guided by his mother's voice telling him to follow the sun to the Great Valley. Read more on Wikipedia.